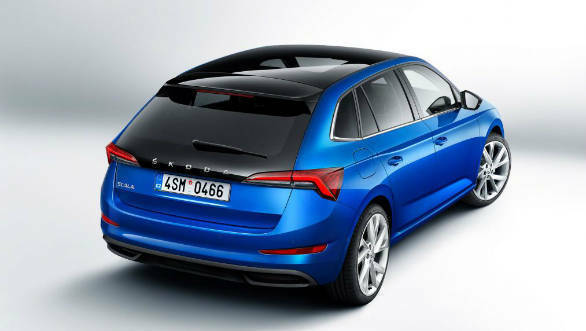 Skoda Auto has unveiled its new entrant in the international premium hatchback market with the Skoda Scala. 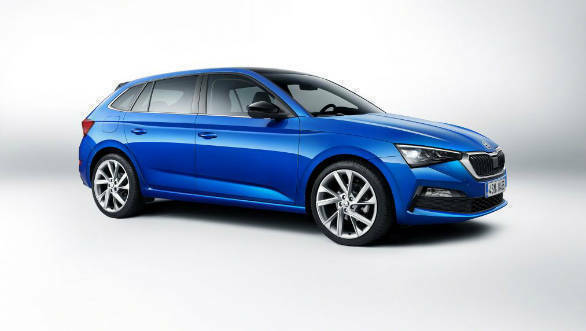 The Scala is significantly larger in size than the Fabia and competes with larger hatchbacks like the Ford focus, VW Golf and the Honda Civic. But unlike the Golf, the Scala is based on the new MQB-A0 platform also found in the new gen Polo and VW T-Roc. The car measures 4,362 mm in length, is 1,793 mm wide, and 1,471 mm high. Wheelbase is 2,649 mm. 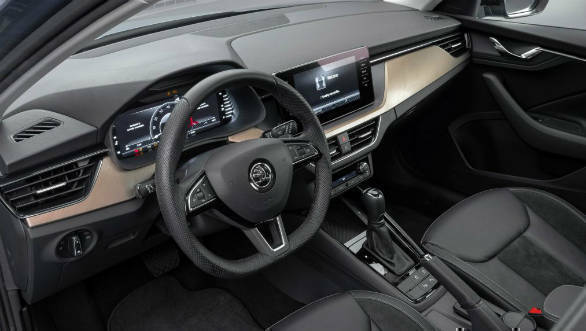 Interestingly, Skoda claims that the Scala has similar rear interior space to the Octavia. Kneeroom is 73 mm in both cars. Elbow room at the rear is 1,425 mm vs 1,449 mm for the Octavia and headroom in the rear is 982 mm as compared to 980 mm in the Octavia. Boot space is 487 litres. The styling of the Scala is noteworthy. It is still distinctly a Skoda with the simple, angular lines but a sizeable dose of flair has been added, the lines are more prominent, the bulges bigger and the cuts sharper. The company says this is a more emotional design language and takes inspiration from the Vision RS concept shown earlier this year at the Geneva Motor Show. 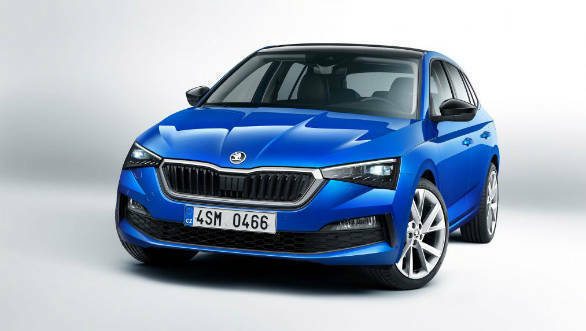 A notable design trait is the the large rear windscreen with wide Skoda lettering, a look which should make its way into more of the brand's cars. The butterfly grille in front is now more shapely too as are the more angular head and tail lamps. This more outward theme follows in the interior too. The setup is quite minimalistic but again uses varied surfacing to bring a more premium feel. A floating touchscreen (6.5, 8.0 or 9.2 inches) and slim AC vents placed lower in the dash are new to this car. Five engine options will be available at launch. There will be three petrol options starting with a 95PS 1.0 TSI, a 115PS version of the same motor and going up to a 1.5 TSI with 150PS. The diesel engine will be a 1.6 TDI with 115PS and 250Nm. A 1.0 litre CNG fuelled motor will also be available putting out 90PS. The base petrol will be powered by a five-speed manual. All other engines get a six-speed manual or a seven-speed twin-clutch automatic. Notable features on Scala will be a par for the course in this segment. There are LED head and tail lights, ambient lighting, nine airbags and a full suite of safety features like adaptive cruise control, emergency braking, blind spot monitoring and so on. Most notable, the Scala comes with a comprehensive sport mode which lowers the car by 15mm and stiffens up the springs for a more engaging drive. Three trim levels will be available in the UK market with features like a panoramic sunroof, an eight-speaker sound system, Wi-Fi hotspot, 3D satellite navigation, wireless smartphone charging, 64GB of internal SSD storage, and downloadable apps for the infotainment system. The Scala will go on sale by the first half of 2019 and should be priced between the Octavia and the Fabia. There is no news on whether this car will make an India debut. We haven't been kind to big expensive hatchbacks such as this one earlier but if Skoda India can bring this in as a more cost-effective alternative to the Octavia, things might turn out differently.